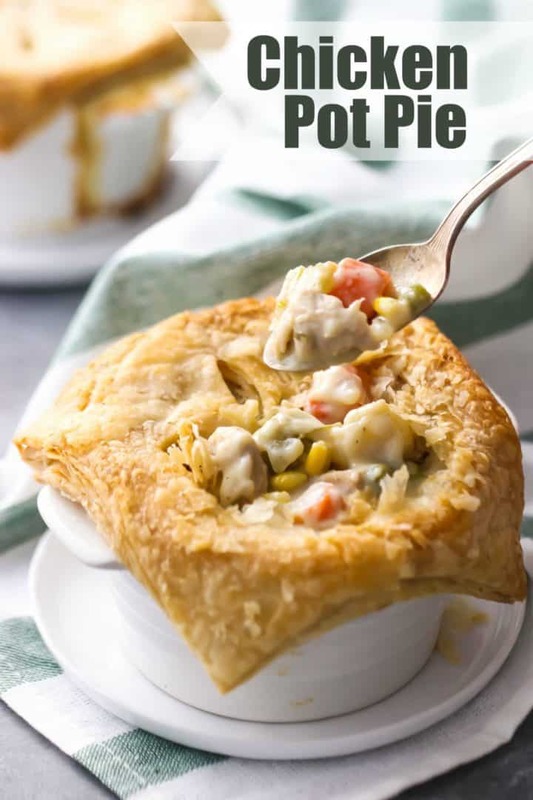 Enjoy comfort food at its best with this easy, make-ahead chicken pot pie recipe! 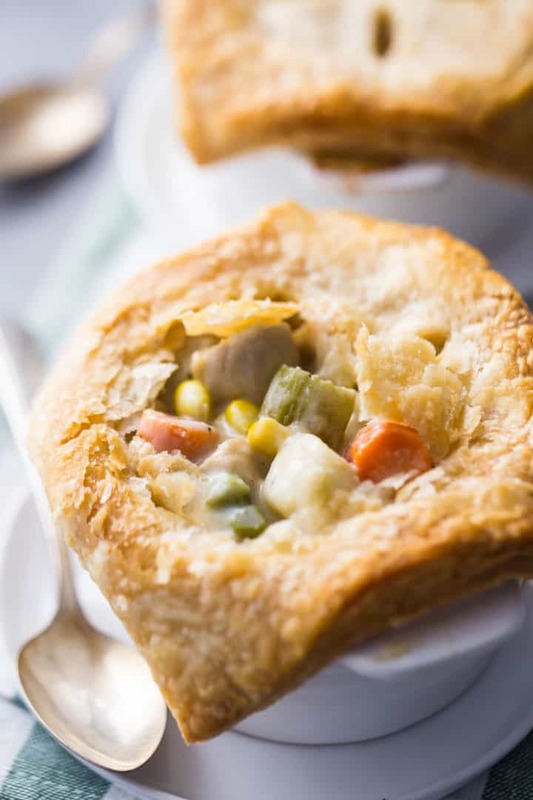 Juicy chicken, tender veggies, & creamy gravy, under a flaky, buttery crust. Hey, have you been enjoying my savory recipes so far? Last week, I made a promise to share more of my favorite one-pot meals, comfort food dinners, and game-day snacks. I posted my favorite chili recipe, along with the most incredibly moist cornbread. And now today, I’m bringing you what is truly a family favorite: chicken pot pie! This meal is definitely a winner. Everyone in my family gets excited when I announce that we’re having chicken pot pie for dinner. We especially love it on a cold winter night. It’s so comforting! Hot and hearty, with a creamy filling and a buttery crust… it’s the best. Exactly what you need to warm you up and fill your tummy with goodness. Chicken pot pie is like the ultimate comfort food. It’s got a creamy, hearty filling of chicken and vegetables, swimming in a thick, rich gravy, all baked under a pastry crust. When you break through that buttery, flaky crust with your spoon, and dig down into the savory filling underneath, it’s so satisfying! It will warm you right down to your toes. It really is the perfect winter meal. WHAT DO YOU PUT IN A CHICKEN POT PIE? 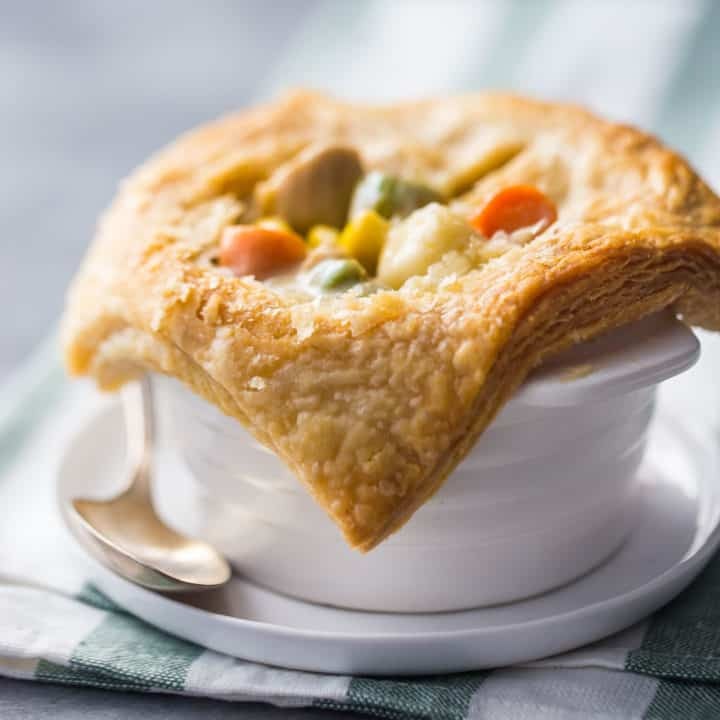 Chicken pot pie is totally adaptable. You can really add anything you like to it! My favorite ingredients (besides chicken, of course) are carrots, onion, and celery, and I like to also add frozen peas and frozen corn. Sometimes I’ll add potatoes too, or leave them out if I’m trying to cut back on the carbs a little. For the crust, I like to use either puff pastry, pie crust, or biscuits. Or you could use crescent roll dough. My family loves them all! Any of these choices will work well, and compliment the filling in the most delicious way. I love making this because the filling whips up in less than 30 minutes, and it makes the whole house smell amazing! Not to mention it all happens in just one pot. I am a HUGE fan of the one pot meal. Start by heating some oil and butter in your pot. When it’s hot and sizzling, brown the meat. I like to use chicken breast tenders, because half the work of cutting it into bite-sized pieces is already done for me. Once the chicken has a nice sear on it, use a slotted spoon to take it out and set it aside. Now add your herbs and veggies. Stir them around in the chicken drippings until they start to soften up a bit. If there’s not much oil left in the bottom of your pot, drop in a bit more butter and let it melt. Then, sprinkle everything with flour. This is going to create a roux that will thicken the gravy. Stir it around until all the veggies are coated in the butter/flour mixture, then deglaze the pot with white wine. I love the flavor that white wine gives, but if you don’t like to cook with wine, feel free to substitute more chicken stock in its place. Slowly add chicken stock to the mix, while stirring. Then, drizzle in your cream. The cream gives this filling the most luxurious texture! Add the chicken back in, along with the frozen peas and corn, and let it all bubble away on the stove until the veggies are tender. Then just spoon it into bowls and add the pastry topping of your choice! My favorite option by far is puff pastry. But I’ll often use pie crust or biscuits too! They are all so good. You can totally get creative with this if you like, but I like to keep things simple and traditional with just salt, pepper, a hint of garlic, bay leaves, and thyme. All of these flavors work so well with the vegetables and the white wine. CAN CHICKEN POT PIE BE MADE AHEAD? 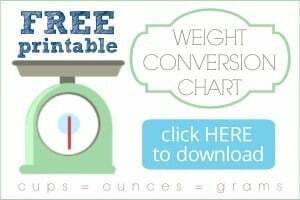 That is one of the things I love most about this recipe- you can totally make it ahead! The filling can be made several days ahead and kept in the fridge. If you’re using puff pastry or pie crust, that can ALSO be made ahead. 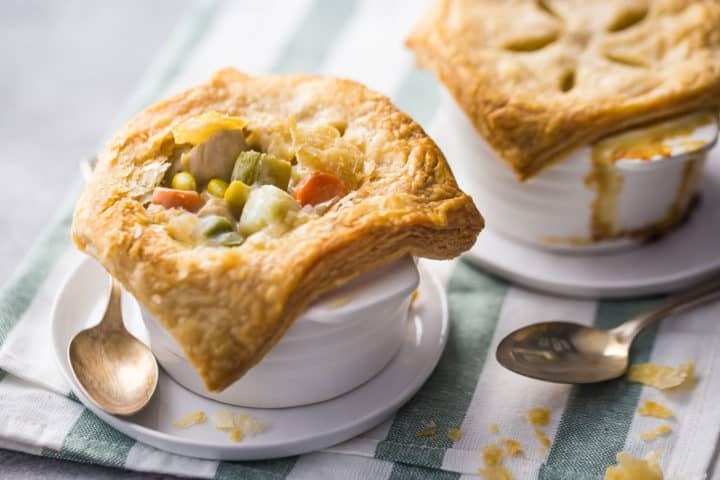 And the individual pot pies can be pre-assembled and kept refrigerated OR frozen until the day you’re ready to serve them. When I make chicken pot pie ahead, I usually fill the bowls with filling, top with pastry, and carefully slip them into a plastic bag. This way the dough doesn’t dry out. Then I just pop them in the fridge until an hour or so before dinner. If you decide to freeze them, transfer them to the refrigerator to thaw the night before you plan to serve them. To reheat any leftovers, just put them in the oven on warm (for my oven this is the lowest setting, 170 degrees F) until hot. If you want to speed this process up a little, give it a head start in the microwave first (about a minute), but I really like to finish it in the oven so that the pastry on top keeps it’s crispy-crustiness. There’s no better time than now for chicken pot pie! Start it simmering on your stove, and enjoy classic comfort food at its best! Place a large pot on the stove over medium-low heat, and add the olive oil and 1 tablespoon of the butter. When the butter is melted and foamy, add the chicken pieces and season to taste with salt, pepper, and garlic powder. Saute the chicken until golden brown, then remove from the pot with a slotted spoon and set aside. Add the carrots, potato, celery, onion, bay leaves, and thyme to the pot and season to taste with salt, pepper, and garlic powder. Saute the vegetables until the onions become translucent, then add the remaining 3 tablespoons of butter. When the butter has melted, sprinkle the flour on top and stir the mixture until all the vegetables are coated in flour. Deglaze the pot with the white wine, scraping the bottom with a spoon to bring any browned bits up into the sauce. Stir in the chicken stock and cream, and bring the mixture to a simmer. Stir in the peas, corn, and reserved chicken pieces. Taste, adjust seasoning as needed, and ladle the filling into bowls. Set aside and allow to cool slightly. Preheat the oven to 400 degrees F, roll the puff pastry out to a thickness of 1/8-inch, and cut into squares that are slightly larger than your serving bowls. Refrigerate. When the oven has come up to temperature, lay a square of pastry over each bowl, and cut vents in the top to allow steam to escape. Bake for 40 to 50 minutes, or until the pastry is puffed and golden brown. *Simply Perfect Homemade Pie Crust, Southern-Style Buttermilk Biscuits, or Crescent Rolls can be substituted. What a fantastic post for chicken pot pie! Gorgeous photos and so many great tips. The recipe sounds delicious! Will definitely give this a try very soon. My husband loves chicken pot pie and this was such a treat for him to come home to! We both loved it!! This truly is a comfort food at its finest! I love the use of puff pastry- makes it that much more decadent! Looks so hearty and delicious! Perfect comfort food on a cold, winter night!